2017 Master Farmer Kent Kleinschmidt has carved out a life and farm business with his wife, Sara, in Logan County. Here's a look at how he wound up as president of multiple organizations and how he gives back. This article is published with permission by Prairie Farmer; it first appeared online and on p. 8 of the March 2017 issue. You can count on Kent Kleinschmidt. On the farm, in the statehouse, at a meeting, as a leader, in his community. Kent is reliable. Kent shows up. Over and over, those were the words of the people who know him best, and qualities that helped earn him the 2017 Prairie Farmer Master Farmer award. Back home, his neighbors concur. “I know I speak for the local farmers in our area when I say that Kent is well respected and the kind of guy that gets stuff done,” says Tazewell County farmer Keith Walker. Kent graduated from Southern Illinois University in 1974 and soon married his high school sweetheart, Sara, herself a farm girl. To come home to Logan County and farm with his father was never a question for them. “Some guys are afraid to try this conservation practice, but I have been using it in my operation for over 25 years, and I’m confident other farmers can use it, too,” Kent says. Long term, Kent says his biggest challenge is nutrient management. “Rates, timing, products, trips over the field — and balancing each of these with a good financial plan,” he adds. To that end, he soil tests and applies fertilizer based on crop removal, and he’s built waterway structures, filter strips and three different types of terraces. He’s also begun testing cover crops. Just out Kent and Sara’s back door, across the yard and down near the barn, begins the pasture, where they graze a small Angus and Red Angus-cross cow-calf herd. Kent can approach and call, and they’ll come running. He enjoys his cows and Sara does, too, having grown up with cattle herself. Their home sits on a high spot in Logan County, where pastures and creeks roll off in the distance, and wind turbines turn nearby. Kent and Sara have two sons; Craig is a corn breeder for AgReliant, and Chad works for a local ag preventative maintenance company and helps on the farm part time. Retired today, Sara spent her career teaching high school math, including advanced calculus and other high-level classes. Today, Kent and Sara enjoy their four grandchildren, too. The Kleinschmidts like to travel throughout the U.S. and internationally. The walls in their home are visual testament to the places they’ve been: Notre Dame, London Bridge, windmills in Holland, the Jefferson Memorial and even the home farm of Kent’s ancestors in Germany. An avid runner and marathoner, Sara often accompanies Kent on trips with farm organizations, biking throughout the city while he’s in meetings. She has a bucket-list trip planned, too: bicycling through the tulips in Holland. Back home, the couple serves in their church, Zion Lutheran Church in Lincoln. Kent traveled to Louisiana several times to help with post-Hurricane Katrina rebuilding, and they’ve donated more than 10,000 pounds of sweet corn to the Peoria Area Food Bank. They’ve also hosted key legislative leaders on their farm, including Bill Cunningham, D-Chicago, the previous Illinois Senate Agriculture Committee chairman. Kent has worked closely over the years with legislators, including former congressman and U.S. Transportation Secretary Ray LaHood, former senator Carol Mosely Braun and former congressman Aaron Schock. The couple even hosted Rep. Darin LaHood’s first fundraiser, right on their farm. Kent is credited with starting the Tazewell County Corn Growers Association 27 years ago. 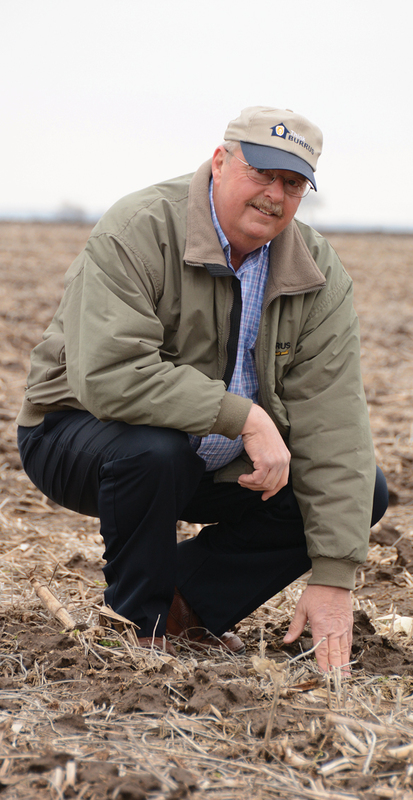 Since then, he’s served as president of both the Illinois Corn Growers Association and the Illinois Corn Marketing Board, and he was chairman of the first Commodity Classic, held 21 years ago. He’s also been named to several committees within the National Corn Growers Association, and is currently president of Tazewell County Farm Bureau. Familiarity: Kent’s cattle graze in a pasture behind the house, where creeks and hills meander off in the distance. He is concerned about regulations that, while designed to prevent nutrient loss, could keep his cattle from drinking from creeks. As Kent Kleinschmidt has traveled the world for state and national commodity organizations, he’s learned a thing or two along the way. Like when IL Corn hosted a public speaker training session and taught him to use props or visuals when speaking. He passed the pictures around the table and LaHood asked to keep them. In the end? The regulations were scrapped. “I thought, ‘Aha, they worked!’ Maybe my pictures made a difference in current-day regulations,” he says.